Rosacea can be frustrating and embarrassing. You wake up with a fresh complexion, thinking today will be a good day for your skin. But then you step outside, only to realize your skin is cherry red once again. Or maybe your face turns red for seemingly any reason – and stays that way for far too long. It seems even the smallest trigger makes your skin flush deeply and there’s no way to hide it. Once diagnosed, many people are further frustrated to learn that rosacea is chronic. What good does it do to know if you have rosacea if you there’s no cure? While you may not be able to get rid of rosacea once and for all, you can learn to manage its triggers. And once you understand what’s causing the redness, you can control the irritation you feel on your skin. In this article, we’ll help you determine if you have rosacea and the best rosacea treatment option for your skin. Rosacea is a tricky condition to diagnose because it looks like other skin issues. It masquerades as a ruddy complexion, acne, or even post-workout redness. If you have acne in addition to rosacea, it’s especially hard to notice because your skin is already red-toned from acne. How does your skin respond after a workout? What happens to your skin when you’re embarrassed? How long does it take for redness to fade? If you have rosacea, you’re going to stay flushed longer than the typical person. For example, for most people redness fades within an hour of working out; people with rosacea stay red for much longer. For people with rosacea, these products and conditions trigger flares. But because they’re part of our daily life, we often don’t notice the cause of the redness. If you realize, “Oh! I had a second glass of red wine and my face got so red!” you likely have rosacea, not another inflammatory condition. The best and safest way to diagnose rosacea is to ask your dermatologist. They’ll be able to ask specific questions and examine the skin to make an accurate diagnosis. Then they’ll create a rosacea treatment plan that works best for you. Rosacea is a chronic inflammatory condition of the skin, occurring anywhere above your waist: chest, scalp, neck, and face. But not every type of rosacea looks the same. People experience various forms of red bumps, red streaks, red patches, itching, and irritation depending on the type of rosacea they have. 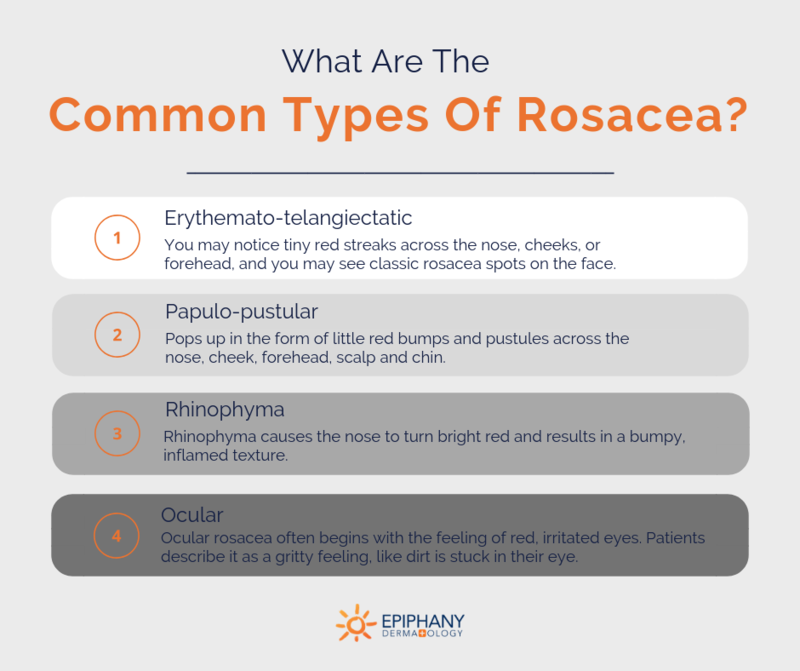 There are four different types of rosacea, each with varying appearance, severity, and treatment options. Here are the basics about each type and the rosacea treatment options for each kind. Yes, the name is a mouthful, but this is actually the mildest form of rosacea. ‘Telangiectasia’ is a fancy word for a broken blood vessel. With this type of rosacea, you may notice little tiny red or purple streaks across the nose, cheeks, and/or forehead. You also may see classic rosacea spots on the face. The skin turns bright red in these areas — it’s not a just a mild blushing effect, it’s severe. In fact, it often looks like you have a fever. Mild Rosacea treatment options can help patients deal with these dilated vessels and persistent flushing. Topical creams help soothe the inflammation of the skin and oral antibiotics and reduce internal inflammation. At Epiphany, we also have laser therapy options, such as Pulse Dye Lasers (PDL) and Intense-Pulse Light (IPL) lasers to reduce the appearance of broken blood vessels. When we use laser therapy to treat rosacea, the light wavelength penetrates through the skin to the blood vessel to absorb the red pigment, causing bruising but no cut through the skin. After a laser treatment, you may notice some bruising that lasts up to two weeks. Sometimes, as we start minimizing overall redness with laser therapy, other blood vessels become more visible. You’ll likely need multiple treatments depending on the severity and how many blood vessels appear after the first treatment. Over time, the redness will decrease significantly. People with papulopustular rosacea usually come into the dermatologist for acne treatment only to discover it’s not acne they’re facing. This type of rosacea pops up in the form of little red bumps and pustules, along with redness and dilated vessels in the central face. Most commonly, they appear across the nose, cheek, forehead, scalp and chin. We treat this mild to moderate rosacea with topical and oral antibiotics. These medications soothe the inflammation in the skin and keeping the redness and swelling to a minimum. Creams (like Soolantra) and oral medications (like doxycycline or minocycline) work to reduce the inflammation. Occasionally, patients experience a painful, red bump as a result of this type of rosacea. If this happens, we can inject it with a steroid to shrink the inflammatory papule. It works to heal the papule much faster than topicals or oral medications. For temporary solutions, vasoconstrictor medications (like Rhofade or Mirvaso) can be applied daily to shrink the blood vessels themselves. However, these are typically not covered by insurance and have a Cinderella effect — it only lasts about 12 hours before it wears off. These medications can be helpful for the times you have a big event, like a wedding or presentation, where you need to look your best and want a temporary fix. Enlargement of the nose is another symptom of rosacea. Rhinophyma causes the nose to turn bright red and results in a bumpy, inflamed texture. People often visit the dermatologist when they realize their nose is getting bigger and redder over time. Like all forms of rosacea, we begin treatment with topical and oral antibiotics to soothe the skin and reduce inflammation. For more severe cases of rhinophyma, we coordinate care with a plastic surgeon to treat the area with a laser therapy or cosmetic surgery that shaves off the extra layers of skin that have been altered into a bumpy appearance. These treatments allow us to re-sculpt the nose back to its normal shape. Most people don’t know that rosacea can affect their eyes too. Ocular rosacea often begins with the feeling of red, irritated eyes. Patients describe it as a gritty feeling, like dirt is stuck in their eye. If you have another type of rosacea, your dermatologist should closely monitor your eye symptoms as well. Your dermatologist can help manage this type of rosacea, but you’ll also receive a referral to an ophthalmologist who can help you treat this eye disorder in the best way possible. If this chronic inflammatory condition goes untreated, it can result in progressive visual loss or eye complications. Ocular rosacea treatment requires a combination of oral antibiotics to reduce inflammation in addition to eye drops to relieve redness and discomfort. The ophthalmologist will monitor your eye health, and make sure the condition is optimally treated. Will Insurance Cover My Rosacea Treatment? Most oral and topical rosacea treatment medications will be covered by your insurance. Rosacea is a medical diagnosis, not a cosmetic term. If your rosacea is severe, work with your dermatologist to document it properly for insurance purposes. Additional treatments for specific cosmetic concerns are usually are not covered by insurance. Most vasoconstrictor medications are not well-covered by insurance, and certain laser treatments will be considered cosmetic rather than medical intervention. There may not be a cure, but there are plenty of rosacea treatments. If you’re suffering from the effects of rosacea, call your dermatologist. 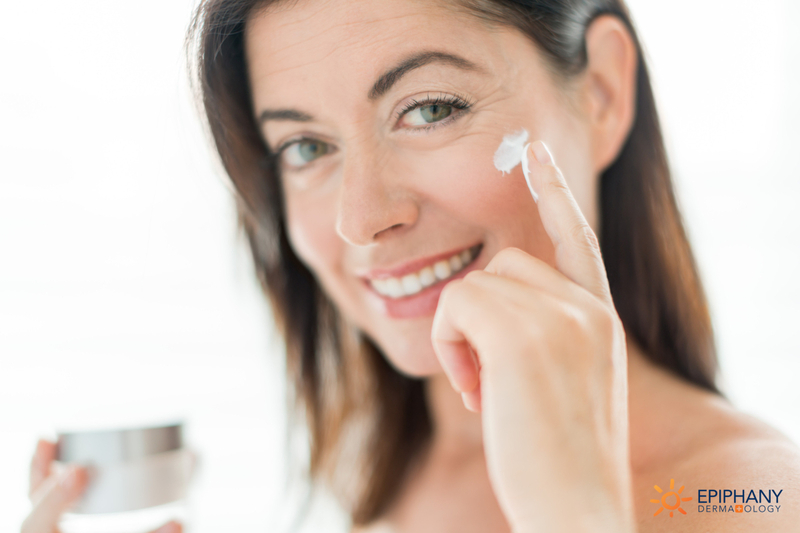 Together you can find a treatment plan that will help minimize your symptoms and identify your triggers so you can keep your skin looking its best. Andrea McLin is a board-certified physician assistant in Coppell and Saginaw, TX. 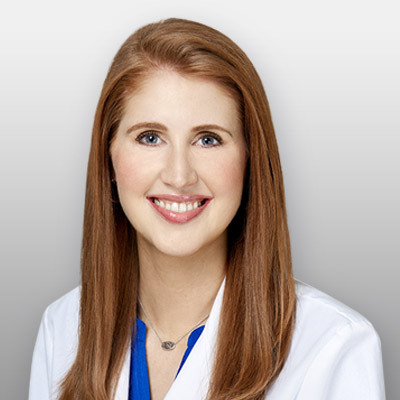 An active member of the American Academy of Physician Assistants, the Society of Dermatology Physician Assistants, and the Texas Academy of Physician Assistants, Andrea has over 7 years of experience and a special interest in acne, rosacea, and skin cancer prevention and treatment. In her spare time, she enjoys camping, scuba diving, and cheering for the University of Kansas Jayhawk basketball team. Learn more about Andrea McLin.